By now you've probably heard all about the FDA's new food label design. Today I want take an in-depth look at some of the changes, focusing on the new "nutrients required" section. Before the change, that section featured vitamin A, vitamin C, calcium, and iron. In the updated label, that same section will jettison vitamin A and vitamin C (the FDA asserts, "In the early 1990’s, American diets lacked Vitamins A and C, but now Vitamins A and C deficiencies in the general population are rare"), replacing them with vitamin D and potassium. Calcium and iron will remain on the label. Though manufacturers can continue to list vitamin A and vitamin C on their labels if they wish, vitamin D and potassium are the new heavy hitters. These two will be required on the updated label because, according to the FDA, "Vitamin D and potassium are nutrients Americans don’t always get enough of, according to nationwide food consumption surveys [...], and when lacking, are associated with increased risk of chronic disease." For similar reasons, calcium and iron are still going to be listed prominently on the new label. Let's take a look at the health impact of the four nutrients that will be required on the new Nutrition Facts label. Vitamin D, according to the Dietary Guidelines for Americans, is a nutrient of public health concern "because low intakes are associated with health concerns." The body can make vitamin D when the skin is exposed to sunlight, so one way to get more of this vital nutrient is to spend some time in the sun (20 minutes is generally recommended as a great way to get some vitamin D without increasing skin cancer risk). However, talk with your doctor about this plan to make sure that getting this nutrient from the sun is worth the possible health risks. You can also find vitamin D in seafood like salmon and tuna, and in fortified products like milk, soymilk, orange juice, and breakfast cereals. Vitamin D is key for good health. The National Institutes of Health's Office of Dietary Supplements explains, "Vitamin D promotes calcium absorption in the gut and maintains adequate serum calcium and phosphate concentrations to enable normal mineralization of bone and to prevent hypocalcemic tetany. It is also needed for bone growth and bone remodeling by osteoblasts and osteoclasts [1,2]. Without sufficient vitamin D, bones can become thin, brittle, or misshapen. Vitamin D sufficiency prevents rickets in children and osteomalacia in adults . Together with calcium, vitamin D also helps protect older adults from osteoporosis." Speaking of calcium, that nutrient is staying on the Nutrition Facts label for good reason! Most people don't get enough calcium each day, and that can be bad news for bone health. MyPlate asserts, "Calcium is used for building bones and teeth and in maintaining bone mass." Without it, your body can't keep your bones and teeth as healthy as they could be. People who don't get enough calcium are also often at risk for osteoporosis. Calcium is a key component of the dairy food group. You can find it in milk, fortified soymilk, yogurt, and cheese. It's also part of fortified cereals and tofu. For a full list of great sources of calcium, don't miss Appendix 11 from the 2015 edition of the Dietary Guidelines for Americans. Now let's move on to iron, another mineral that is staying on the label through its transition to the new look. The U.S. National Library of Medicine explains that "iron is part of hemoglobin, a protein which carries oxygen from our lungs throughout our bodies. It helps our muscles store and use oxygen. Iron is also part of many other proteins and enzymes." It's staying on the label because too little of it can lead to health complications. The Dietary Guidelines for Americans say, "For young children, women capable of becoming pregnant, and women who are pregnant, low intake of iron also is of public health concern." Getting too little iron can lead to iron deficiency anemia, which happens when the blood cannot carry enough oxygen throughout the body. There are lots of food sources of iron. Heme iron (which is easier for your body to absorb) can be found in animal products like lean meat, poultry, and seafood. Non-heme iron is present in many different vegetables: think beans and peas and leafy greens. Some foods, like breakfast cereals or breads, are also fortified with iron. It's worth noting that too much iron can also pose a health risk. Too much iron can lead to hemochromatosis, a.k.a. iron overload disease, a buildup of excess iron in the body. This buildup can cause liver damage and heart problems, along with lasting issues that can affect the endocrine glands, joints, and pancreas. Make sure your iron intake is not too low and not too high. And now let's address the final nutrient that is making its way into the "nutrients required" section of the new food label: potassium. Potassium has been a nutrient of public health concern for quite some time, and most people don't get nearly enough of it. Since, according to the FDA "potassium helps to lower blood pressure," not getting enough of it can pose serious health concerns. Luckily, the Dietary Guidelines for Americans has insight on how to turn this around. They assert, "Low intakes of potassium are due to low intakes of vegetables, fruits, and dairy," maintaining, "To increase potassium, focus on food choices with the most potassium [...] such as white potatoes, beet greens, white beans, plain yogurt, and sweet potato." The new Nutrition Facts label will list how much of each of those nutrients are available in a given food, along with what percentage of the total daily nutrient need that that product will fulfill. That percentage is called the percent daily value, and it is also changing on the new label. 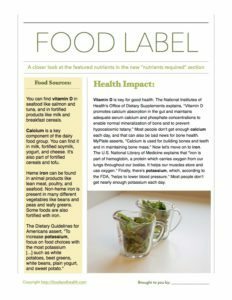 Find out how in the member-exclusive post Daily Values 101, which comes with a helpful handout about more changes to the label. And here's a new printable handout that features the highlights of today's post. New Food Label Vinyl Banner and Banner Stand 26" X 62"
*Note: This data comes from the recommended daily allowance (RDA) of each nutrient, as catalogued in the National Institutes of Health's Office of Dietary Supplements and the Food and Nutrition Center of the USDA.